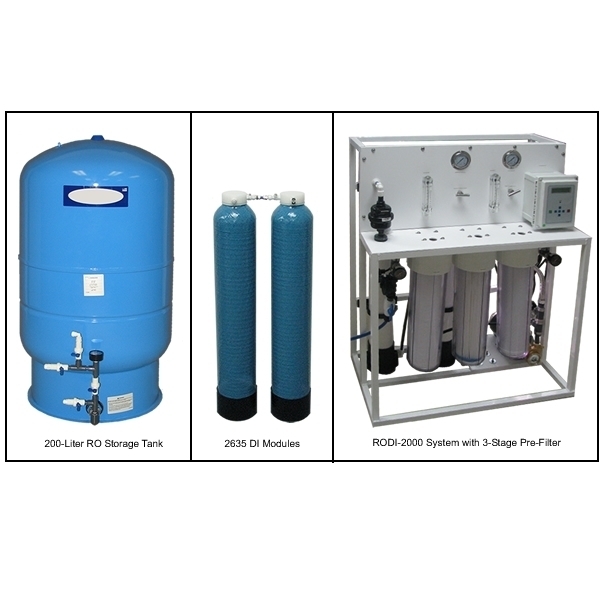 This combination Reverse Osmosis System and 8-12 Liters/minute DI System is utilized in operations using virtually any quality tap water. The system is mounted on a welded aluminum frame and includes a built-in three stage pre-filter assembly. The RO portion of the system will economically remove >97% of the contaminants from the incoming water, and will produce RO pretreated water at the rate of ~ 1-GPM. The RO water is stored in a 200-Liter pressurized storage tank for use by the DI portion of the system. The pressurized tank eliminates the risk of airborne contamination and the need for a feed pump. The DI portion of the system produces up to 18.2-Megohm-cm water that is free of Pyrogen, Endotoxin, RNase and DNase at a flow rate of 8-12 Liters/minute. 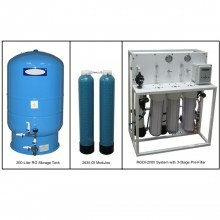 DI water production is limited by the storage capacity and RO production. This system features continuous recirculation to maintain maximum water purity and a digital conductivity/resistivity meter to monitor the DI water quality. The meter has a green LED to indicate that the water quality is acceptable and a red LED that alerts the user when the water quality drops below the desired level.